This semester, I'm teaching a course focusing on Ta-Nehisi Coates. The class will be comprised of first-year black men college students. 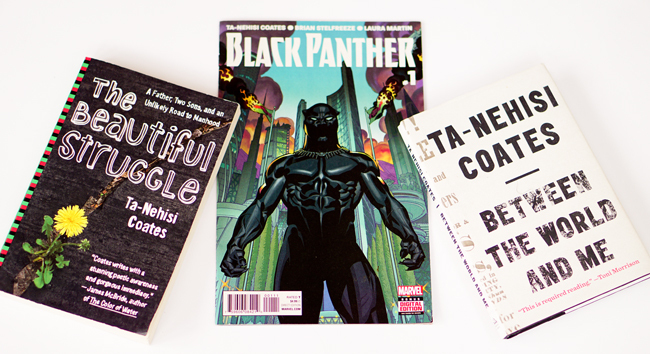 We'll take a look at a sampling of Coates's blog entries, his article "The Case for Reparations," his book Between the World and Me, and his first story arc for the Black Panther comic book. I've taught writings by Coates in the past, but this is the first time I'm devoting a full class to his works. In various classes some years ago, my students and I covered Coates's The Beautiful Struggle (2008). Every now and then in classes, I brought in some of his blog entries, and one of my classes covered Between the World and Me when it came out last year. This course will give me an opportunity to introduce a group of guys to an important black writer, and at the same time, we'll get to consider several related writers as well as a wide range of topics and different modes of creative communication like blogging and comic book writing. I'll run entries here about what the course entails as well as some of my observations of what we're covering.